Competition is always great, especially for consumers. First there were mobile voice calling price wars, then came the eCommerce wars (and it is far from over) and I think the next battleground seems to be Taxi fare prices. Indian rental cab market is evolving at fast pace. While there have been number of players in taxi rental space for quite a while, with the rise of new-age mobile-and-tech-enabled taxi rental, this space has seen players aggressively taking steps to capture Indian cab-traveling consumers’. On the other hand, fast-growing San Francisco based Uber Cabs announced that they are introducing their affordable segment in three more Indian cities of Mumbai, Chennai and Pune. It is already available in Delhi and Bangalore. Uber Cabs recently launched in Ahmedabad, Chandigarh, Jaipur and Kolkata bringing the total cities to 10. India is now the largest market in terms of number of cities outside of US. Uber has come up with a comparison chart to show how cheap Uber X is for it’s consumers. Here is for people traveling in Pune from point A to point B in various modes of transport. While Ola has slashed its rates only in Delhi, these new low-fares are sure to be propagated soon to other cities as well. It is interesting to note that Ola’s rates being cheaper than Uber X (about 4 Rs. per km) are nearly equivalent to what a Auto Rickshaw charges in city of Pune (see above chart). Indian Taxi market is huge and is estimated to be in the region of $6 to $9 billion. However, a very small percentage (4% to 6%) of it organized. So, for taxi rental aggregators and providers, this is a huge untapped market. Even with rise of many new players in this space, they are unable to keep up with growing consumer demands. In addition to this, it looks like very soon fares for these cabs are going to come to a level of what Auto-rickshaw charges to consumers. If that happens, most consumers will obviously prefer to travel by cabs rather than Auto-rickshaws. This will expand the market tremendously. There is no doubt that these fall of rates is great for consumers – however, the key thing would be to see how these new age players are able to cope up with growing demand. I have personally traveled with Uber and Ola couple of times, and the experience has been beyond my expectation. If such service is available at affordable rates, I may even ditch taking my own car from place A to place B, and so will many others. The Taxi wars have begun and we will see who is the last man standing! "Indian Taxi Price Wars. Ola Slashes Fares to Rs. 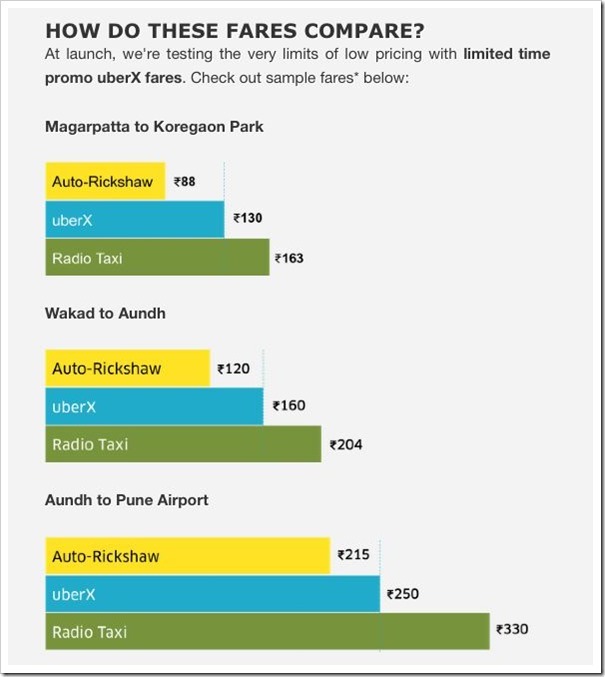 10/km, Low Priced UberX Comes to Pune, Mumbai", 5 out of 5 based on 1 ratings. The behavior of the drivers of these cab companies are questionable. Thus, I prefer to hire cabs from local cab agencies. Recently I had a very bad experience with these app based taxi operators. Almost all are same… For Pune Mumbai trip I paid 4000 rs. online to ***bs, but their driver informed me 1 hour before the journey start that he had some issues so he is not coming. I called their office and request them to make an alternate arrangement. They assure me, but after 10 min. they refuse to provide me another cab. They return the money, but deducted 500 as a service charge… But, for what service? I can’t understand why app based agencies are always want to access the all data present in our smart-phone. Check out their privacy policies during the installation of their apps. Looking forward to reductions in Hyderabad. tip: TaxiForSure in launching in Pune , probably 18th of Sept.
Uber just reduced its UberBlack prices in Delhi NCR to Rs. 18 / km.